The name Misty Kush is a tribute to a legendary Nirvana strain of yesteryear, the Misty. She is based on a big yielding Medusa mom and a highly resinous Master Kush dad. This elite strain resembles the old Misty strain in stature. She has a bushy structure, with big oval-shaped fan leaves, has a medium to dark-green color, rapid flowering and is of medium height. Misty Kush is ideal for SOG or SCROG to maximize yields. On a hydroponics system you will be able to shorten the flowering period by one week. 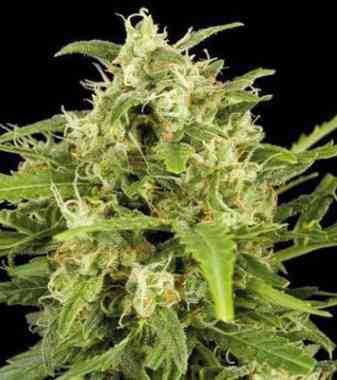 She is a massive budding beast with enormous triangular-shaped colas and is suited for both indoor and outdoor. Misty Kush is a rapidly growing strain that looks a lot like her ancestors, Misty and White Widow in structure. Abundant trichome formation can create a potentially high level of THC. Bud structure is dense and compact with nuggets hard as rock. The terpenes produce a wonderful taste and aroma of exotic fruit, slightly sweet with hints of lemon and mango. The high is long lasting: a relaxing powerful body-stone. For pain management, cramps and muscular spasms she works wonders.